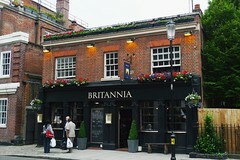 Note: According to the Dec 2014 London Drinker, the Britannia was refurbished in 2014; we haven't visited since, so some details below may be out of date. It's quite posh inside, with a variety of seating including upholstered banquettes with scatter cushions and backs probably high enough to please even bob; plus at least one deep leather sofa, and upright chairs and tables as well. There's also a separate dining area, set out with wine glasses and cutlery, at the back past the sofa area, and a thin strip of outside seating sandwiched between the pub and the building next door. Kake visited on a Monday afternoon in September 2008. Only one of their two handpumps was in operation, serving Young's Bitter at £3.10/pint. They also had Staropramen, Leffe, and Peroni on tap, among other things. When I arrived, a little after 4pm, the place was empty apart from two people sitting outside in the smoking area. Piped music was playing, sort of pop/jazz, but fairly quietly. According to their website as of September 2012, food is served noon-3pm and 5pm-10pm Mon-Fri, noon-10pm Sat, and noon-9:30pm Sun. On my September 2008 visit they also served food in the afternoon, described slightly misleadingly as "bar bites", but actually a choice between cheese-and-bacon-stuffed potato skins (£6) and filled rolls (£7, served with salad and chips). I went for the latter, choosing cheddar and onion from among the four options on offer. The roll was a pretty nice one with a thick chewy crust (in a good way), the cheese was grated, and the onion was red and thinly sliced. The salad consisted of varied mixed leaves with a decent dressing. The chips were more like potato wedges, and came skin-on. I think they were probably prepared earlier and reheated in the microwave, but they didn't suffer much. This ensemble was served slightly absurdly on a small, thick, square chopping board. I was brought salt and pepper (both in proper grinders) as well as ketchup and mayonnaise for my chips, but no vinegar. Accessibility: One shallow step up to get in, and level access to the bar and the front seating area, but the sofa/banquette area and the toilets are down a couple of steps. Last visited by Kake, September 2008. Opening hours and food times taken from the Britannia website, September 2012. Last edited 2014-11-22 12:26:38 (version 12; diff). List all versions. Page last edited 2014-11-22 12:26:38 (version 12).